Fresh oysters half-shells, like the ones above, should be enjoyed right away. 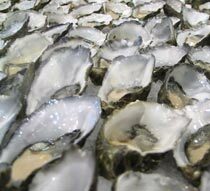 Plan to consume Drakes Bay Family Farms Oysters as soon as possible. Fresh oysters should have a pleasant sea-breeze aroma. Store in the refrigerator in a shallow bowl covered by a damp cloth. Do not store live oysters in a plastic bag or tightly sealed container. The shells should be tightly closed. If a shell is slightly agape, it should close after it is tapped.